Polydextrose, Citric Acid, Natural & Artificial Flavors, Silicon Dioxide, Sucralose, Acesulfame Potassium (Ace-K), FD&C Red #40. Mix 1 level scoop in 6-8 oz water once daily, preferably in the morning. NO LOADING PHASE IS REQUIRED. Use only as directed. This product is for use by healthy adults only and not to be sold to or used by anyone under age 18. DO NOT USE if you are pregnant, expect to become pregnant, or are nursing. Consult a physician before using this or any dietary supplement or before starting any diet or exercise program. CONSULT A PHYSICIAN BEFORE USE if you have been treated for, diagnosed with, or have a family history of any medical condition, are taking any prescription or over-the-counter drug, including but not limited to antidepressants (such as MAO inhibitors), stimulants, allergy medications, anti-hypertensive drugs, medications for other cardiovascular conditions (such as blood thinners), or medications that may negatively interact with increased dietary nitrate intake. DO NOT USE if you are taking nitrates for chest pain, medications for erectile dysfunction (such as PDE-5 inhibitors), or another nitrate-containing dietary supplement. DO NOT USE if you are allergic to coconuts. IMMEDIATELY DISCONTINUE USE and call physician if you experience any adverse reaction. Discontinue use two weeks prior to surgery. KEEP OUT OF REACH OF CHILDREN. Store in a cool, dry place away from sunlight, moisture, and heat. Always keep tightly sealed. Do not use if safety seal is broken, missing, or has been tampered with. Malic Acid, Polydextrose, Natural &Artificial Flavors, Silicon Dioxide, Sucralose, Ace K, FD&C Yellow #5, FD&C Blue #1. 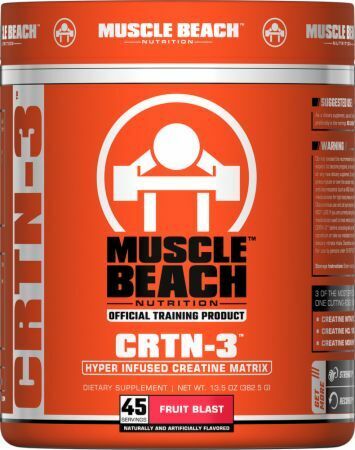 CRTN-3is the first-time fusion of Creatine Nitrate, Creatine Hydrochloride, and Creatine Monohydrate, along with our Hydro-GO electrolyte matrix, will help you push harder, get stronger, recover quicker, and reach your goals faster than ever before. 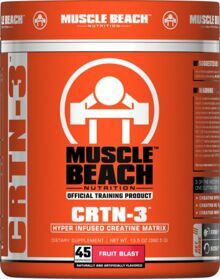 * Experience the progress with every rep.
CRNT-3 does not contain any substance banned by the NCAA, IOC, WADA, or any mixed martial arts, bodybuilding, powerlifting, or weightlifting federation, or by the U.S. Armed Forces.